Congratulations to the newest winners! A good selection of cards! sunstamper and Hawaiian like this post. Another poll of something with to many favorites! mrslaird, muscrat and Hawaiian like this post. smadson and Hawaiian like this post. Look what came in the mail today....Creative Scrapbooker magazine published my Bible cover. I always hoped to have a card published, but I was excited to be asked to submit and then have the cover chosen. mcschmidty, sunstamper, Vickie Y and 23 others like this post. I still think you guys need to make a US tour! I would meet you in Chicago and bring you to Indiana for a visit. And I'd pick her up in Denver and bring her home with me for a visit too! Well finally I can get back to my computer. I tried to comment earlier on my ohone but kept losing signal and started over about three times. Finally gave up until we hit a stopping place in our travels tonight. Anyway, I was excited to see (thanks to Sharon) that I had won something. And when I saw that it was Simon Says Stamp I was even more excited. I have had a wish list going on their site for quite a while and I can't wait to pull the trigger and order some cool new stuff - and now I can order even more. Thanks to everyone who has commented on my card and offered congrats! mrslaird, JBgreendawn, LizBeth1976 and 4 others like this post. Oh yes, Gail I forgot to say super congrats on your publication! Your bible cover is so gorgeous. I love nature elements in cards and the tones in your cover are fantastic! lazylizard and Hawaiian like this post. I'd be happy to pick you up in Sacramento. We live up the hill from there - in the direction of Lake Tahoe! Congratulations, Gail, on your Bible cover. So pretty and that is exciting! smadson, cdimick, Hawaiian and 1 others like this post. And congrats Gail on your cover....great job. LOL, I think we'd need more than three weeks to get around the US and see even a fraction of my online friends. I consider myself fortunate to have met so many SCSers passing through Dublin. Congratulations on the publication, Gail. mrslaird, mamaxsix, smadson and 4 others like this post. Thank you all for the notification and super sweet comments on my Fallidays card about the prize. I will have to go back and see the other winners I had not seen this thread until yesterday. It has been super busy for me and I have not been feeling well for a few weeks. Headed to the doctor tomorrow hopefully they can get me some help and answers. I will check back to the other winners here soon and leave some love. mrslaird and Kemernow like this post. My husband and I would love to pop over for a visit and then you could really hug a mod . It's been at least six years since we were in Greece, even longer since we were in Crete. Our last two visits were to Corfu and to Astros in the Peloponnese. Well, my invitation still stands, even if you decide to take a LOOOOONG trip to the US first. In 2015 passed through Dublin on my way to Roundstone on the West coast, where I spent a week with my Dutch folk music loving friends. We used to meet up a few times per month (well, they still do), making music and singing primarily Irish and Scottisch folk songs. The core members try to spend a week together every two years. In 2013 we went to Scotland, two years ago we went to Ireland and this year the others decided to pay me a visit here in Greece. They were staying in the 2 airbnb villas next door, which was awesome. pvilbaum, mamaxsix, Cook22 and 1 others like this post. Congrats, Gail!!!!! That's awesome! It's beautiful!!! I am sure sorry that we couldn’t meet up while we were there! We tried, though. A huge congratulations to Gail! Beautiful!! Your cover is just beautiful, Gail. Congrats! It was definitely the highlight of our trip to meet you and even cooler that our husbands hit it off too! Cook22 and smadson like this post. If she wanted to see the country-side of life I would bring here from the MOA to New Prague! Sometimes you have to believe it before you can see it.Out of the Maze --Spencer Johnson, M.D. How is that you found SCS on-line being in Dublin? I was looking online for a tutorial for waterfall cards, because I was having huge trouble with one in a magazine. I guess we must have had reasonable broadband by then because I doubt if it would have been very practical with the old dial-up! It's amazing how you get used to technology and can't remember being without it. I still remember the first graphics package I got came on a CD and our computer at the time didn't even have a CD drive; my brother, doing a computer degree at the time, had to put it on his PC and rig a cable to transfer it all over to ours. I wish we did have unlimited time and money to come and travel and visit! DH has some motorbike association contacts too . mamaxsix, smadson and cdimick like this post. Congratulations, Gail! I LOVE Creative Scrapbooker magazine! I just bought the Winter issue yesterday but only got a couple pages into it. Now, I can have even more anticipation as I read to see something from someone I "know"! Congrats to the newest winner ! Gail - Beuatiful cover ! Congratulations, Gail. That is gorgeous! Gail- so cool! Congrats! Sabrina- if you are near Seattle I can visit with you! Much happiness to all the prize winners and an extra special congratulations to Gail on your publication! I'm so freaking frustrated with doctors, DH is still in afib, still no clue what they will do about it. My whole family now has the creeping crud of a cold. Want to stamp and decorate but can't muster up the energy. 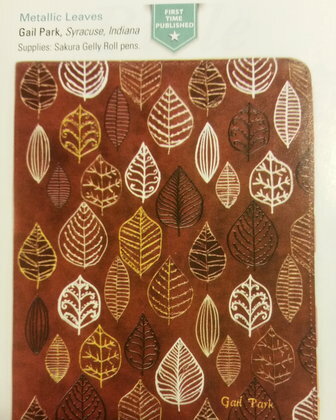 Gail, I am loving the bible journal cover- Congrats!!! !!! I have only done one page in my journal- I do not want to color in a bible. I found 2 paperback bibles at a convent near us that just closed, they had LOTS of them, so for $1.00 I thought I could just tear out the scripture I wanted to use on a page and that was not write in my bible. Gail, I’m in Mishawaka, between South Bend and Elkhart. Hi, neighbor! How cool. We should get together some time. You two are pretty close! That would be cool to meet up! You're both special ladies and I think you'd have a great visit! Gail, I�m in Mishawaka, between South Bend and Elkhart. Hi, neighbor! I'm just a little south of both of you; I'm in Monticello. CONGRATS, Gail! What a beautiful bible cover. I've never been in Monticello, Indiana though I have been to Monticello in Virginia.